In July 1924 Gurdjieff was severely injured in a near-fatal car crash. By August, realizing there was not sufficient time to prepare his students, Gurdjieff disbanded the Institute. For nearly four months Gurdjieff pondered the situation. Then on December 16, 1924, a stupendous idea arose and he began to dictate: "It was in the year 223 after the creation of the World by objective time-calculation, or, as it would be said here on the 'Earth,' in the year 1921 after the birth of Christ. Through the Universe flew the ship Karnak of the 'trans-space' communication." 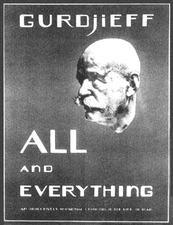 Gurdjieff would defeat time by hurling the teaching into the future by writing a Legominism of three series of books under the title All and Everything. A Legominism is a means of transmitting through initiates information about certain events which occurred on the planet Earth long ages ago. Initiates are those who have acquired in their presences, through personal conscious labors and intentional sufferings, almost equal objective data which could be sensed by other beings and which evoke trust and respect. The Great Pyramid, chess and tarot are examples of Legominisms. The first draft of the First Series, Beelzebub's Tales to His Grandson, was completed in 1928. Gurdjieff would observe students as chapters were read aloud to them; a practice he continued until nearly the end of his life. Changes in the text were made accordingly. The book was published in 1950. Seven years later a revision of the book began. The revised edition was published in 1992. It evoked much controversy and was later withdrawn. The Second Series, Meetings with Remarkable Men, is an esoteric work in the form of autobiography written to furnish, as Gurdjieff said, "the material required for a new creation." This title reveals the depth and intensity of Gurdjieff's search which attracted to him significant influences whom he calls, "remarkable men." Gurdjieff encountered these fellow seekers as he traveled throughout the Middle East, including Egypt, Africa, and Central Asia in search the origin of an ancient teaching. In 1935 he completed the Third Series, Life Is Real Only Then, When 'I Am'though some contend he left it unfinished. Whether Gurdjieff did or did not finish the Third Series remains open to debate. But without doubt it is the most esoteric of the three books. In 1933 he published The Herald of Coming Good. Later he withdrew it from publication because it did not have the desired effect, but, while difficult to read, it provides an invaluable perspective. He speaks about Tzvarnoharno, the subconscious, hypnotism, vanity and the discovery "that the force and degree of man's inner benevolence evokes in others a proportionate degree of ill-will." Views from the Real World presents Gurdjieff's actual words and his direct instructions given in conversations, talks and lectures at the Prieuré and as he traveled with his pupils who would record his words faithfully from memory. In addition to the talks and lectures Views from the Real World contains Glimpses of Truths, an account of a conversation with Gurdjieff written by an unknown Moscow pupil in 1914 and mentioned by P. D. Ouspensky in In Search of the Miraculous. Madame Thomas de Hartmann, with Gurdjieff from 1917, was present at all the meetings and lectures, and acknowledged the authenticity of the material as presented in Views from the Real World. Included also, in English, are some of the Aphorisms inscribed on the walls of the study house at the Prieuré in a special alphabet known only to the pupils.